San Ysidro Health is dedicated to providing high quality, accessible and affordable medical, dental and behavioral health services. Our patients are at the center of our care. Please allow us to introduce members of our staff & support team, as well as several of our wonderful patients. You will notice their shared stories and photographs throughout the website. We also invite you to review our Frequently Asked Questions and Glossary of Terms. We hope you find our Glossary of Terms helpful as you navigate through our website. Please download & complete the pre-registration form, below, and bring with you to one of our clinics in order to be fully registered. Driver’s License or valid Passaport, birth certificate, or other valid photo identification (If the address on your ID card or driver’s license is not current you will need to provide current utility bill, rental agreement or bank statement which has your current address). *Note: The San Ysidro Health clinic discount program is only available to patients who are without insurance coverage at the time of their application. Please see one of Certified Eligibility Specialist / CES or Patient Access Representatives for full details of various discount programs, federal & state assistance programs, accepted insurance plans, photo identification requirements, registration assistance for minors (patients under 18 years old), English / Español bilingual assistance, sign language & foreign language interpreters, and more. “I had been a patient at the San Ysidro Health’s Otay Family Health Clinic for several years, and would regularly receive my pap smears and mammograms there. In December of 2009, during my breast self-exam, I found a lump in my right breast. After a month, I decided to make an appointment at the health center and they were helpful in being able to schedule it right away. The doctor sent me to get a mammogram and an ultrasound, right away. “Once the results came in, I was sent for a biopsy. Finally, they gave me the results… I had cancer. The doctor was more worried than I was, at the time. Later that day, I met with my patient navigator, Maria Elena Meza. She explained how she was going to help me, gave me all the information I needed and, even, helped me fill out some forms. She was very helpful, because I was so confused and scared that I did not know where to start. She also referred me to the support group for cancer survivors, where they helped me and explained everything about what I was going to go through — including the possible effects of chemotherapy and radiation. Gabriel is an adorable four year old boy living with serious medical conditions, including cerebral palsy and hydrocephalus. For these reasons, he needs specialty medical appointments, multiple follow-ups and unique therapeutic services. In 2011, Gabriel’s family decided to seek medical care at San Ysidro Health Center. Fortunately for the family, they were able to find a number of caring staff members within our clinics who were concerned for Gabriel’s development and overall health. San Ysidro Health’s wonderful pediatrician, Dr. Theodora Nelson, was able to promptly start referrals to multiple specialists. She also referred Gabriel to our health center’s Pediatric Care Coordinator (PCC), Michelle Favela, to assist his family in connecting with all of the services he and his family would need, both, medical and non-medical. The PCC worked closely with Gabriel’s mother, his pediatrician and the health center’s Developmental-Behavioral Specialist, who was also involved in his care. Soon after these introductions were made, Gabriel was able to start receiving specialty care and was also accepted into various therapeutic programs to assist with his language and motor skills. Currently, Gabriel is a pre-school student and has an Individualized Education Plan (IEP) which allows him to receive certain special education services. He has also been able to qualify for participation in the curriculum at The San Diego Regional Center, to receive therapeutic services through California Children’s Services (CCS) and attends ongoing follow-up visits with multiple specialists at Children’s Hospital. Many outstanding accomplishments have been possible with San Ysidro Health’s Care Coordination Program, a team approach utilizing effective communication between multiple service providers. Gabriel is now a much healthier child, receiving all of the medical and therapeutic services he needs. His family is extremely grateful for the generous amounts of help and guidance which they have received at San Ysidro Health Center. I am blessed to have had greater than 30 years of healthcare and community service experience. I received my nursing degree from the University of Phoenix and am a graduate of the Women’s Health Nurse Practitioner Program, Educational Programs Associates, in San Jose, Ca. 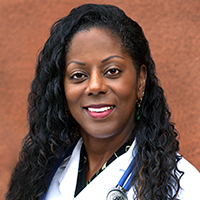 I presently serve as a Women’s Health Nurse Practitioner with San Ysidro Health of San Diego, in the KCHC’s Women’s Wellness Center. My responsibilities include assessment, diagnosis, plan of treatment, and evaluation of all aspects of care related to Women’s Health. My greater than five years affiliation with San Ysidro Health is a win- win for everyone – the clinician, the patient and the community. As a clinician, it provides me a great deal of professional fulfillment to work along with other highly skilled clinicians committed to improving the health of other San Diego residents. San Ysidro Health management and staff are proactive, creative and collaborative in their approach to improving lives, promoting health and disease prevention. San Ysidro Health is my # 1 recommendation for clinician satisfaction and health care services. Since Jasmine’s birth, Tarik hasn’t stopped praying to God to help his daughter. Now five years old, Jasmine suffers from devastating medical conditions, including Cerebral Palsy, severe delays in full brain development, and seizures. She is unable to walk or talk. As a result, Tarik says a sense of sadness is always with him. Despite her constraints, Tarik describes his daughter as a happy child who loves to play and to watch “Barney.” He will never lose hope that Jasmine’s condition will eventually improve. Balancing Jasmine’s special needs, especially while caring for two other children, is not easy. Jasmine requires a lot of help, and she sees a variety of medical specialists. Each day brings a series of hurdles. So, when Jasmine’s parents received a referral to San Ysidro Health's Pediatric Dental Clinic, where her disabilities would not prevent her from receiving dental treatment, they felt a true sense of relief.